President Donald Trump speaks during a rally in El Paso, Texas, Feb. 11, 2019. Rival political rallies in Texas – just 200 meters apart – pitted the president of the United States against a possible election rival as they took opposite sides on the merits of a border wall with Mexico. “Today we started a big, beautiful wall right on the Rio Grande,” declared President Donald Trump, apparently a reference to fencing being erected along the river that divides Mexico from the United States. This comes just days before a deadline for Congress to agree on a border security plan to avert another partial shutdown of the federal government. Large red banners with white lettering spelling out ‘FINISH THE WALL’ loomed over Trump’s event. As Trump spoke at the El Paso County Coliseum, a former local congressman now prominent in the Democratic Party addressed an anti-border wall rally, so close to the president's event that the loudspeakers from the Trump function could be heard. 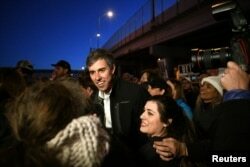 Beto O'Rourke, Democratic former Texas congressman, participates in an anti-Trump march in El Paso, Texas, Feb. 11, 2019. The president said 69,000 people had signed up to his rally, but that only 10,000 had been allowed inside while thousands more outside viewed the event on large video screens. El Paso Fire Department Public Information Officer Enrique Aguilar told the El Paso Times newspaper that no special permission had been given and the venue had a capacity crowd of 6,500 people in it during the president's rally. O’Rourke has made no formal announcement on entering the increasingly crowded field of Democrats hoping to directly challenge Trump next year. The opposition rally, which followed a march from a high school, attracted about 7,000 people, according to an event organizer, citing an estimate from local law enforcement officials. Trump returned to the Texas border city – across from the city of Juarez in Mexico – following a conversation with the state’s attorney general, Ken Paxton, who told the president that the wall there had drastically reduced crime. El Paso’s Republican mayor, Dee Margo, ahead of Trump’s visit, said the wall was not the sole deterrent for reducing illegal immigration and curbing criminals. FILE - A new barrier is built along the Texas-Mexico border near downtown El Paso, Jan. 22, 2019. Such barriers have been a part of El Paso for decades and are currently being expanded. An analysis published by a local newspaper detailed how the crime rate in El Paso peaked in the early 1990’s and has risen and fallen in a fairly narrow band since construction of a border wall there – which began in 2008 during the presidency of George W. Bush and was completed the following year when Barack Obama was president. “The city has been one of the safest in the United State of America for 20 years and counting,” according to O’Rourke. Just before Trump began speaking in the border city, lawmakers from both parties announced they had the outline of an agreement that includes border barrier funding, after reviving negotiations that had halted over the weekend amid a disagreement on immigration enforcement rules. The deal would provide $1.375 billion for fixing 88 kilometers of border fencing, according to congressional aides. 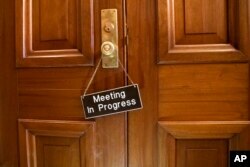 A sign hangs on the Senate Appropriations Committee room at the Capitol as bipartisan House and Senate bargainers trying to negotiate a border security compromise in hope of avoiding another government shutdown, in in Washington, Feb. 11, 2019. A group of lawmakers, including Republican Sen. Richard Shelby and Democratic Rep. Nita Lowey, said staff members would work out the details later in the week. The major sticking point, according to aides on Capitol Hill, had been a Democrat-proposed new limit on the number of immigrants detained within the United States, not at the border. Republicans wanted no cap on apprehension of immigrants charged with or convicted of certain crimes. The prospective agreement reached Monday evening includes no such caps, according to congressional staff members. Trump told the El Paso rally he got word of the agreement just as he was taking the stage and had been told progress has been made. “So, we probably have some good news. Who knows,” added Trump. The lack of an agreement on money for border security imperils passing an overall spending bill before a deadline Friday, when short-term funding approval expires. Without such an agreement, part of the federal government again faces a shutdown. Lawmakers have expressed concern there might not be enough time for legislation to move through both house of Congress and reach Trump’s desk for a signature by Friday when funding expires for the Department of Homeland Security, the Justice Department and some other government agencies. The acting White House chief of staff, Mick Mulvaney, said Sunday on the NBC program Meet the Press that “you absolutely cannot” rule out another government shutdown, when he was asked about negotiations over funding for Trump’s proposed border wall. A record-long 35-day shutdown this past December and into early January of this year froze the paychecks of 800,000 federal government employees. White House officials confirm Trump has readied a plan to declare a national emergency on the southern border that would allow him to redirect money from other federal projects to build a portion of wall. Opponents of that potential action – including some prominent members of the president’s own party -- predict any declaration by Trump of such a national emergency will be immediately subject to a court challenge.